This 17 inch carpet bonnet is great for scrubbing those heavily soiled areas of carpeting. 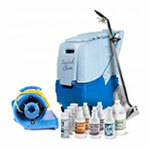 For use with any one of our floor scrubbers, 17 inches or above. Use with our Traffic Lane Cleaner listed below, and scrub the carpeting, then follow with an extractor to completely extract all detergent out of the carpet.